EDITOR’S NOTE: Help us build the world’s best MTG Trading app! Support us on Kickstarter HERE. There’s a single refrain going through my head Monday morning. Before we discuss changes at all, let’s get one thing straight: sell all Golgari Grave-Trolls and Worldgorger Dragons now and don’t look back. Now that Ancestral Recall, Demonic Tutor, and Survival of the Fittest are finally banned in Legacy, we can star…oh, they were banned in Modern? Huh. Immediately obvious is that Wizards realized that reprinting Recall was probably a bad idea. Anyone that has played with the card outside of Standard certainly would have had no doubts about this. Drawing three cards on turn two is unsurprisingly powerful. Dig Through Time is similarly busted. DTT’s strength was muted in the face of Cruise, but it was quietly showing up in combo decks all over the place. Had DTT been allowed to stay, it would have replaced Cruise everywhere, and I’m guessing some combo deck would have become insurmountable eventually. Finally, Pod is exiting Modern amidst the joyous revelry of many. It was the industry standard best deck in the format for a very long time, and the recent addition of Siege Rhino made the deck even stronger. Survival of the Fittest was banned in Legacy many years ago, and all that did was tutor the creature. Pod tutored and gave you a big discount on mana. How was it ever fair? Moving on, our goal is to figure out what the post-announcement landscape looks like for Modern and Legacy in order to identify cards whose play value has risen dramatically. If we can find cards that quietly get much stronger with this change, we can sink our money into them and watch them rise in price. We’ll start unpacking Modern. The TC and DTT ban is actually reasonably easy to understand. Both are very new additions to the format, and if we rewind back to September of 2014 we can see what a pre-KTK Modern looks like. If this was the only change we’d know exactly what to expect. We’d take pre-KTK, add Monastery Swiftspear, and that would be your format. It’s not quite that simple though, because the change isn’t just TC and DTT. We also have to account for banning Pod (big change) and tossing GGT in (small change). What has risen dramatically since TC and DTT hit the scene? Chalice of the Void certainly has. It’s tripled in value, mostly as a way to combat all the cheap spells that were used to fuel TC. While Chalice was a reasonable card before KTK, and will continue to be so afterwards, the supervillain he’s been chasing was just put in jail. With a lot less work to do, we should see prices slowly settle closer to $10. Other than CotV, there haven’t been a lot of dramatic Modern risers. TC and DTT pushed small spells such as Gitaxian Probe, Forked Bolt, and Serum Visions. Fatestitcher jumped a few bucks I guess, but that’s a niche card. Orzhov Pontiff has risen hard just recently, although he hasn’t even unpacked in his new office and already he’s out of a job. Jeskai Ascendancy was a card I expected to be banned this time around if both TC and DTT didn’t eat it. They did, and so it didn’t. I suppose Wizards is hoping it won’t be degenerate enough, while still providing gas for Young Pyromancer and the soon-to-be-legal Monastery Mentor. Both major JA lists ran TC and/or DTT, so the deck definitely has to change. Thankfully Wizards has seen fit to provide us with a humble little card drawer. He’s not as cleanly powerful as TC or DTT, but the ceiling on how many cards Humble Defector can draw is much higher. Just keep responding to the triggers at instant speed and you can go bananas. Yes, you don’t get the cards from any of the Humble triggers until you lose control of him, but instant speed cantrips and JA looting means that you can easily trigger him two, three, or six+ times in one shot. I just drew twelve cards, here’s your Humble Defector idiot. Financially, foil Jeskai Ascendancies are more appealing now, as they’ve survived their most tenuous ban window. Other than that it’s tough to say. Foil Humble Defectors for sure, but we already knew that. Without seeing some lists it’s hard to know exactly what could rise. Pay close attention to sleeper rares in any successful JA lists. Let’s try going the other direction. What has taken a beating since the printing of TC and DTT? Thoughtseize and Liliana of the Veil stand out to me as cards most directly benefiting from these bans. Each plays an attrition game that is attempting to strip their opponent of cards and then grind them down with Tarmogoyfs. An opponent topdecking Cruise meant that all the work Thoughtseize had done was irrelevant. GBx has all but disappeared with TC and DTT going way over the top of discard. With those card drawing powerhouses now absent, both Thoughtseize and Liliana are much better positioned. It also turns out that both have pretty depressed prices at the moment. Liliana was between $70 and $90 last year up until late October, but has since crashed towards $50. We’ll almost definitely be seeing her climb back up towards $60 at least. Dark Confidant is also part of that trio, and his price on MTGO has doubled or so since the announcement. The paper copy won’t see that type of movement, especially with the threat of a reprint hanging on the horizon, but I could see him getting $10 back. Losing TC and DTT isn’t the only reason Thoughtseize and Liliana get better either. Siege Rhino has proven itself in Modern as a powerful, game-ending threat that is nearly impossible to race. Up until now it’s been a growing Pod staple, but with that deck out the door as well, Rhino will be looking for somewhere to go. A return of GBw is nigh-inevitable, with Thoughtseize, Liliana, and Rhino leading the crash. Here, I’ll define the first week of post-ban Modern for you: Thoughtseize, Murderous Cut, Tasigur, Dark Confidant, Abrupt Decay, Tarmogoyf, Liliana of the Veil, Siege Rhino, Restoration Angel. Another archetype that seems to have fallen off the map in recent months is UWR variants. It still pops up from time to time, but seemingly far less than it did. UWR mainstays such as Celestial Colonnade, Snapcaster Mage, and Restoration Angel all gain some traction with the loss of TC and DTT as well. Restoration Angel is appealing with Siege Rhino leaving his hoofprint on Modern in a big way. Snapcaster is also as close to a slam dunk as you can get. He’s been quiet the last few months with everyone eating their own graveyard seven cards at a time, but with TC and DDT gone, he’ll be back in a big way. Just as important is the fact that Innistrad won’t be in MM2. I don’t see how Snapcaster doesn’t hit at least $50 this year. How about the loss of Pod though? What’s that do to Modern? This is a much more complex question, since we don’t have a recent save file without Pod. Right off the bat a few cards lose steam. We already talked about Orzhov Pontiff. Voice of Resurgence doesn’t really have any other homes in Modern outside of Pod right now, so we’ll see the price slide on that in the short term. Voice is still an objectively powerful card though, so don’t count it out entirely. As the format shifts around, it’s entirely possible he pops back up as a four-of in a different top tier deck. Snagging a playset from a dejected Pod player wouldn’t be a bad idea if you don’t own any. After all, if that GBw list picks up steam, he’s a great counter to the UWR lists I also expect to grow in popularity. On a metagame scale, Pod tended to prey on other creature decks. Trying to beat Pod with dudes was nigh impossible between Voice, Finks, Rhino, Linvala, and finally the ability to occasionally combo out and win on the spot. With Pod out of the format, we may see an increase in creature based decks. Is the banning of Pod the actual unbanning of Wild Nacatl? It certainly may be. We haven’t seen traditional Zoo in a while, which would probably come to the party with Knight of the Reliquary and Baneslayer Angel. What I’m more interested in is Domain Zoo. Most notably Domain Zoo brings with it Wild Nacatl and Geist of Saint Traft. Domain Zoo lists are typically quite powerful, being able to curve Nacatl into Tarmogoyf into Geist, and they pack plenty of removal to make sure they’re getting through. Even better is that they’re technically able to play any card they need since all five colors are represented in their manabase. Geist of Saint Traft has been low for quite some time, and this may be his chance to shine. Most likely to stand in his way is that as the new elbow room in the format that Geist occupies is the same space Liliana of the Veil is in. Will the loss of Birthing Pod put Scotty Mac on the Pro Tour? Time will tell. Scapeshift and Tron picked on Pod, so with their main prey suddenly absent from the food chain, life is more difficult for them. The rise of Thoughtseize and Liliana will be especially hard on those two decks. Even worse for Scapeshift is the loss of DTT. After casting DTT for UU, going back to Peer Through Depths for 1U is going to be a bitter pill to swallow indeed. While Tron is fairly resilient, wasn’t affected directly by the bannings, and is about to gain access to Ugin, Scapeshift just got a lot softer. It may be time to step away from that list for the time being if discard and attrition comes back in a big way. How about Golgari Grave-Troll? Does that bring anything to the table that didn’t exist before? He certainly makes Vengevine look a lot more tempting. Vengevine has taken a beating in price the last year, and is now hanging around south of $15. A breakout performance would change that rapidly though, so if that’s the type of card you like to play, a personal playset may not be the worst idea. I was recently thinking about Sidisi, Mesmeric Orb, and Vengevine. GGT would be a welcome addition. Other cards that play well with Vengevine are graveyard heros Bloodghast and Gravecrawler, which are both quite reasonable right now. Those two pop up from time to time in Modern anyways, so if you’ve been on the fence, now is the time. Life from the Loam is always on the table as well, although with three printings under its belt, I’m not buying in. In all honest, GGT doesn’t really do that much for us. 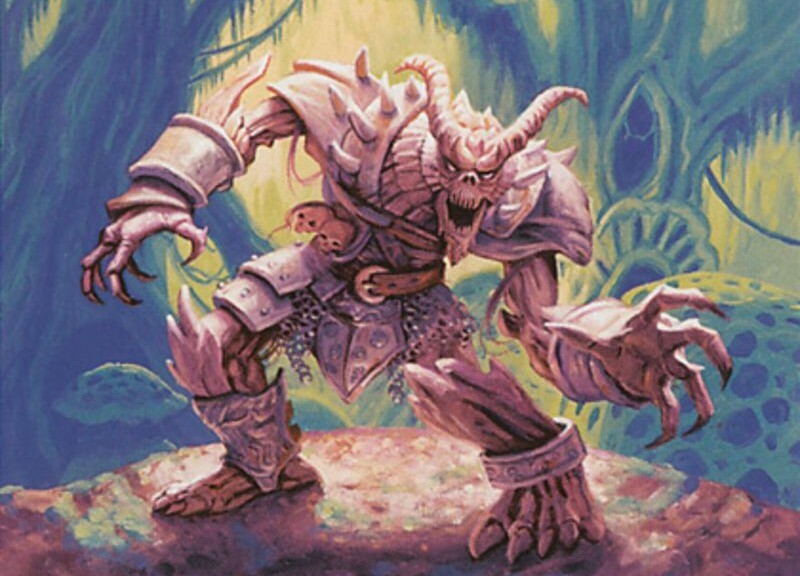 Stinkweed Imp and Golgari Thug both exist already, so what does GGT give us that we didn’t already have? It’s a better dredge rate than we had before, sure, but is that what was holding back dredge-based decks? I’m guessing it wasn’t, but time will tell. Dread Return is still banned but Unburial Rites is legal. Maybe with more and better dredgers we see a more dedicated Unburial Rites/Goryo’s Vengeance list? It’s certainly possible. Goryo’s has always felt like it’s on the cusp. A turn two EoT Grisly Salvage flipping any one of GGT, Imp, or Thug, then untapping, dredging, and going off with Goryo’s, Griselbrand, and Fury of the Horde may be the new hotness. While writing my Fate Reforged set review I discussed the possibility that if both TC and DTT are banned in Modern, Temporal Trespass becomes a bit more real. It’s now the only relevant blue delve spell in the format, which means there may in fact be a place for it. That turboturn deck would almost definitely play it as a four-of, and I could see any Cryptic Command deck considering a copy. After all, Scapeshift loves a good Explore. Over in Legacy, things are a bit simpler. Again, we know exactly what the format looked like pre-TC. Just like in Modern, expect to see a lot more attrition come back in week one. Suddenly Shardless Bug and some of the *Blade decks are relevant again. Shardless Agent will likely see a rise in price after having gotten soft over the last two months. Wasteland gets better. Of note is the fact that Dig Through Time didn’t go. Up until now it’s been much quieter in Legacy than Modern and Standard. While any Cruise deck may choose to play DTT instead, I have a sneaking suspicion that the real winner here is Omnitell. The deck has been doing well lately, as DTT provides the deck a huge amount of gas. DTT also plays well against the incoming onslaught of attrition decks. Omniscience and Show and Tell stand to gain from this announcement, and this may be what pushes S&T to the brink of bannability. That, or they just kill DTT two updates from now. More obviously, the Worldgorger unban has some impact. For those that don’t understand why it was banned in the first place, it’s because of the interaction with Animate Dead. Without any other creatures in any graveyard, casting Animate Dead on Worldgorger results in an infinite loop. Animate brings Worldgorger back, who then exiles Animate, so Worldgorger dies, causing Animate to come back into play, animating Worldgorger, who then…you see where this is going. This loop is capable of acting as a win condition too. All your lands constantly being exiled and put back into play allows you to make infinite mana, so any instants in your and possibly your opponent’s hand are live. An instant-speed fireball is a simple kill, or if Nephalia Drownyard is one of your lands in play you can mill your opponent out and then stop the combo on one of the creatures that ended up in their graveyard. Aside from Worldgorger Dragon himself rising in price, it’s unlikely this will do a lot for anything else in the format. Reanimator is already very clearly a deck. Unless Worldgorger ends up pushing the power level of the deck way higher than before, which is rather unlikely, nothing much changes. Worth noting though is that Show & Tell is usually in Reanimator lists, which already stands to profit from these changes. Between now and the end of February there will be a great deal of flux in Modern, especially with the Pro tour not far away. What we’re seeing now is only the first few ripples of what will be a long causal chain with impacts that are hidden to us behind the veil of time. Will Abzan Attrition rise to top dog? RUG Twin? Is Amulet Bloom the future? Will popular opinion be that Griselbrand should be banned by this summer? What do you think will happen? Previous PostHelp us build the ultimate MTG mobile app!Next PostDay 2 MTGPrice.com Mobile App Update: $8,945 of $10,000 raised! Treasure Cruise and Dig Through Time were two of the fastest banned cards since their launch. Liliana of the Veil is a terrible matchup against Golgar-Grave Troll. To be fair, artifacts are just blue cards that non-blue mages can play. But all the good Delve cards just got banned. What good is delving now? Soulflayer is also no joke.